Product Description The personal-sized MiniFuge is designed for low speed centrifugation of tubes and strips; maximum speed is 6000rpm/2000G. This unit is ideal for quick spindowns from the walls and caps of tubes as well as microfiltration and other low speed applications. It features a compact design with a small footprint and may be used in cold rooms. The MiniFuge is supplied with easily interchangeable rotors to accommodate microtubes and PCR strips. It quickly accelerates to maximum speed and stops quickly. 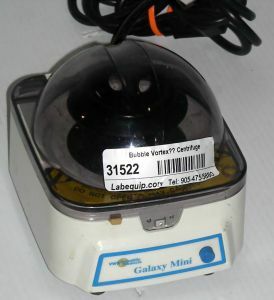 The Galaxy Mini also features an on/off power switch for basic operational control. With the switch in the "on" position, the rotor starts spinning when the transparent lid is closed. The rotor will stop spinning when the lid release button is pressed. Requires less than six square inches of bench space and is suitable for use in a cold room. This MiniFuge is supplied with a rotor for eight 1.5mL or 2.0mL tubes.